Want to be part of a team that creates movies or video games that captivate an audience through storytelling and creativity? Do you believe that learning 3D animation is a critical step in achieving that goal? If you’re ready to make use of your creative skills and technical savvy to take a step up in life and create a brighter future with a rewarding career, Laurus College is your school. The career-focused Bachelor of Science Degree program in Digital Arts and Computer Animation prepares students for a multi-faceted career in the animation industry, including video game development, feature film animation, and visual effects creation. The goal of this Bachelor’s Degree program is to help students develop the creative and technical skills essential to pursuing a successful career in the computer animation industry. Students will be given the opportunity to acquire fundamental and advanced techniques used throughout the computer animation industry by conducting research, practical application, and self-development. Students will use industry standard software to explore different techniques used to model, texture, rig, animate, and render digital works of art. Students will also be expected to develop a portfolio that can be used to seek employment within the computer animation industry. Is a Career in Digital Arts Right for You? Find Out! 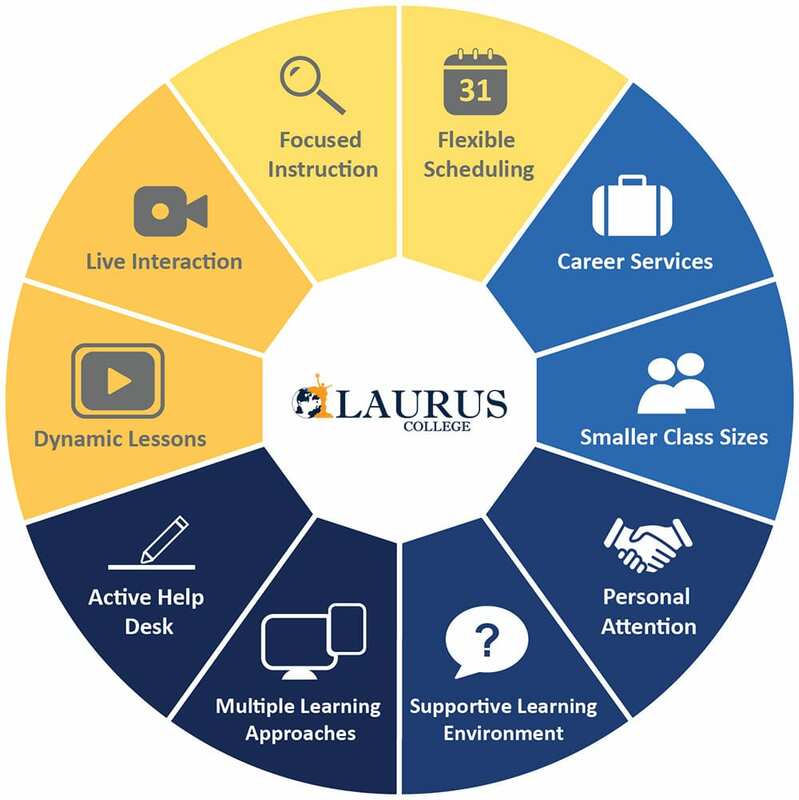 Take the "Laurus College Digital Arts Career Training Readiness Quiz"
Communication: Students will demonstrate effective oral and written communication skills; communicate concisely, professionally, and accurately in various professional modes, including emails and presentations. Critical Thinking: Students will demonstrate critical thinking skills by formulating problems and developing achievable solutions; create, analyze and evaluate appropriate solutions, including those for ambiguous problems; streamline information for relevancy; effectively articulate their thinking processes throughout the problem-solving process. Creativity: Students will exhibit a strong understanding of principles of design, color theory, and composition to create captivating 2D and 3D computer graphics, including illustrations, characters, environments, and animations; demonstrate an understanding of the techniques used in planning, developing, and finalizing digital works of art to meet production requirements in a timely manner. Proficiency: Students will demonstrate an understanding of the proper workflow for a verity of software used throughout the animation industry, recognize individual software strengths, utilize creative control provided by software, develop a tailored skillset to achieve industry readiness, and apply practical application skillset to real world production problems. Specialization: Students will demonstrate skillfulness and problem solving abilities of one or more particular specializations within the animation production pipeline, including, illustration, modeling, texturing, rigging, animation, and compositing for feature film, VFX, and video games. Digital Arts and Computer Animation professionals create special effects, animation, or other visual images using film, video, computers, or other electronic tools and media for use in products or creations, such as computer games, movies, music videos, and commercials. The Standard Occupational Classification (SOC) system is used by Federal statistical agencies to classify workers into occupational categories for the purpose of collecting, calculating, or disseminating data. The Digital Arts and Computer Animation Bachelor of Science Degree Program offered at Laurus College can help prepare graduates for a variety of careers that include, but are not limited to the list of careers that may be listed under the following SOC codes (for more information on a particular SOC code, visit www.onetonline.org). We offer online Bachelor’s Degree programs – and let you keep your day job while you learn. You can participate in live classes from the comfort of your home! That means you’re in control of your learning experience. All you have to do is get the ball rolling. And training with Laurus for a career in web design, with all our dedicated support from Day 1 till you land that dream job, is a smart choice. Develop your creative and technical skills in 3D modeling, texturing, rigging, animating and rendering digital works of art, while also expanding your critical thinking and problem solving ability. 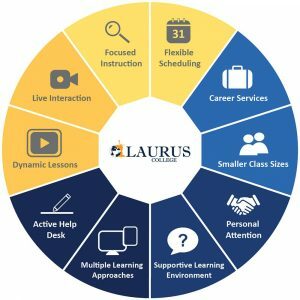 With a program led by industry professionals, Laurus helps motivated people get the skills, experience, and ongoing support to pursue successful careers. If you’d like to know more about the careers available to grads of our Digital Arts & Computer Animation program and explore whether Laurus is right for you, fill out the form on this page to receive more information. The study of life processes ecological factors and the plant and animal kingdoms; biological systems and their control; Human anatomy and physiology; Human Diseases, genetics, inheritance and evolution; the cell as the basic unit of life. This course will introduce students to the world of drawing and design within a digital work environment. The course focuses on foundation skills found in traditional drawing and painting as well as digital image creation techniques used throughout the design process today. Topics covered in the course may be found in multiple art disciplines giving students a wide range of skills also an understating of techniques used to create some of the world’s greatest art pieces. This course will take students through the process of understanding how light works to create color. In this class students may uncover the science behind color and how light allows us to see color. This course may cover topics on color spectrum, the behavior of light as it is reflected, refracted and absorbed, value, hue, saturation, color harmony, and contrast. This course will take students through each step of modeling a character from head to toe, from the first polygon to the final hair. Students study creating and modifying curves, and the principles behind creating curves and surfaces. Students study the differences in character modeling and hard surface modeling, as well as the tools used in Maya for creating each technique and effect. Students examine creating an organic model using curves and surface tools. Students work with modifying tools such as rebuilding curve/surface; attach/detach curves and surfaces, project tangent, and free form fillet. Students also study the various polygon tools available in Maya and how they are used in modeling and creation. Students will also sample the Paint Effects tool in Maya to create and modify textures used in character modeling. This course further expands the student’s proficiency with the Maya software as they examine the tools and techniques for rendering using this program. Students in this course learn to produce realistic environments and images through use of various shading, camera, lighting, and layering techniques. Students explore how various objects, materials, and environments are affected by lighting, textures, and shadows. This course includes how to use the rendering tool of Ray tracing to produce realistic reflections and refractions and how to integrate 2D and 3D images to create innovative environments and scenes. Providing students with the skills to optimize rendering quality and to troubleshoot common rendering problems is the focus of this class. In this class we will look at Motion Graphics tools and the Motion Graphics Industry. Students will learn how to create eye-catching motion graphics projects. This course teaches students how to develop skeletal and muscular controls for animated 2D and 3D characters. Students examine primary and secondary motion for animated characters, as well as how to apply various motions to a created figure. Students explore ways to create realistic figures, as well as fantasy based characters with outrageous proportions and features such as wings and multiple appendages. This course demonstrates to students the techniques involved in modeling, detailing, optimizing, texturing, rigging, binding, and animating characters using Maya. This course takes students through the process of designing, modeling, and setting up animation controls for complex 3D characters. Students study how a character’s skin and joints move through various motions. This course will take students through the fundamentals of Zbrush. From building a basic mesh in Maya and exporting the mesh into Zbrush for final detail work. The class may be covering topics on interface layout, digital sculpture, texturing in Zbrush, and exporting normal maps, and displacement maps back into Maya. In this class we will look at what makes a life-less 3D model turn into a living breathing character. Students will learn how to add realism and life to their animations by studying human behavior and acting. Students learn to add personality and appeal to animated actions. In this course students will learn to create realistic 3D character models using the latest techniques used in the game and film industry. Students will learn to differentiate between technique and practice used when modeling organic objects, as opposed to their previously learned hard surface modeling skills. This course will introduce students to the next step in the 3D animation pipeline after modeling. This course’s primary focus is on techniques used to create multiple types of texture maps to be used in development of shader and material networks, then applying those shader and material networks to 3D models. Topics covered may be but not limited to U.V. layout, texture painting techniques, and shader development process. This course focus is on the creation and technique used in creating animation rigs. From characters to cars everything created in 3D requires an animation rigs to control how it will move, rotate, squash and stretch. This course will take a look at character rigging, mechanical rigging and skinning technique to be used in both film and video game industries. This course introduces students to creating a video game using the Maya software.Students focus on the methods and techniques on how to effectively use the tools to produce 3D polygonal games within the Maya environment. Students design a video game character, create environments with backgrounds, and produce the animation to apply to their game creation. Students will review character modeling and animation techniques, as well as rendering techniques, and apply them to motion and control. Students work with various levels and effects to create a fun and exciting final game product. In this class we will look at motion capture and digital scan data. Students will learn how to clean up captured data so that it can be used in the CG pipeline. This course provides an in-depth look into some of Photoshop’s most advanced capabilities that artists can take advantage of. This class will focus on the use of non-destructive workflow methods and techniques, which will students to efficiently cater to art director’s needs by making flexible documents that are easy to change. The concept of value painting and blending modes will be explored in-depth, as well as advanced photo manipulation techniques. This course will introduce students to the fundamental aspects of digital compositing. Students will learn how to combine live film with digital renderings so that they blend seamlessly. Topics that will be covered in this class are advanced Green Screen techniques, rotoscoping, camera matching, and a multitude of advanced compositing techniques to make film shots blend seamlessly together. Students will learn the coding language Python. Python is a universal language used across a multitude of industries. Python is used heavily in the visual effects industry as it is universally compatible with the various software packages the industry uses. Students will learn how to create useful scripts to automate tasks, preform specific functions, and create useful tools they can use to speed up their workflow. In this course you will expand upon the design concepts you gained in DIG 240 and will put these concepts to practical use. We will explore a 2D game from start to finish using the Unity Game. You will be introduced to scripting using the C# programming language. By the end of the course you will have completed a 2D game and you will have gained additional insight into the game development process. In this course we will take a look at the key differences between game animation and cinematic animation. This class will focus on creating game specific animations such as walk cycles, combat actions, and jumps rather than character acting. Students will learn how to make solid animations from every angle so that a character can move convincingly through 3D space. We will explore working with both hand keyed and procedural animation. This course will take you through each step in creating rounded organic shapes and characters in Maya. This class will focus on moving beyond the modeling skills you acquired in foundations and Modeling, by looking at how to create plants and animals in Maya. We will explore how to create characters and natural settings in Maya, giving the artist the ability to quickly move from modeling to rigging and animating characters. In this class we will look at the importance of acting in animation. Students will learn how to record their own performances to use as reference for animation. We will discuss topics such as body language, expression of emotion, and what makes for a convincing performance. We will then apply these ideas by animating a performance of our own. This class will focus on building assets for games. Students will start by learning the distinct differences between modeling for film and modeling for games. Students will learn how to work under the constraints of a polycount, as well as explore the importance of the silhouette in game design. Students will learn the various constraints of texture maps based on game genre and output platform, as well as the differences between CPU and GPU rendering. We will explore various texturing techniques used in the game industry. Students will get hands on experience with industry standard rendering software and will learn advanced rendering techniques used in the visual effects industry. Students will learn how to create complex shading networks, advanced light effects, and produce photo real renderings. This intensive course introduces students to various modeling techniques, and workflows for creating indoor and outdoor environments using software state of the art animation software. By studying Principle of Economics, students gain an understanding of the fundamentals surrounding Economics, master important economic concepts and use economic theories to analyze micro- and macroeconomic phenomena in our daily life. Students learn about business cycles, business growth, international trade, finance, competition, and consumers. Students also learn how to watch the business environment for changes and implement the correct business strategies. English provides students with the basic rhetorical foundations to prepare them for the demands of academic and professional writing. Students in this course will learn and practice the strategies and processes that successful writers employ when communicating information. These strategies include reading analytically and strategically, improving reading comprehension, writing persuasively, writing for investigative purposes, problem-resolution, evaluation, explanation, and refutation. English provides students with the basic research foundations and skills to prepare them for the demands of academic and professional writing. Students in this course will learn and practice the strategies and processes that successful writers employ when researching topics and information to prepare reports and arguments. The course will culminate with a written research paper and the presentation of the student’s research for peer response. This course builds on the foundation of ENG100 (English Composition I) and ENG 200 (English Composition II) by introducing students to effective rhetorical concepts—both classical and modern—and to apply relevant analysis. Understanding classical rhetorical devices—logos, pathos, and ethos—and how writer’s effectively use them to sway opinion provides students with a methodology of being able to appropriately judge the information they encounter in both the academic and professional arena. Additionally, this course will help students hone their skills in argumentation and presentation. This course introduces tools used by sociologists to explore and understand society. Social relationships, social structures and processes are explored. Psychology is the science of behavior and mental processes. In this class, students will dive into what makes themselves and others behave the way they do. Topics covered in this class include Neuroscience, Sensation and Perception, Learning, Memory, Thinking and Intelligence, Developmental Psychology, Personality Theories and Assessment, Social Psychology, Abnormal Psychology, and Workplace Psychology. This class will be focused more on behavior as it pertains to the workplace rather than the clinical side of Psychology. Students will explore common challenges and experiences that unite the human past and identify key global patterns over time. This overview of world history covers political, economic, social, religious, intellectual, cultural, and military history in a chronological story that will help students gain an appreciation and understanding of the distinctive character and development of individual cultures in society. This course provides students with a conceptual understanding of algebra by using problem solving applications in context to real-world application. Students will integrate meaningful applications with relevant data, graphs, tables, charts, colors, and diagrams. This course covers descriptive statistics and inferential statistics with relevant applications to solving real-world problems, hypothesis testing and decision-making. Important statistical models and distributions will be discussed. This course introduces students to physical science. Students will learn about physics, chemistry, astronomy, meteorology, and geology. This will give students the ability to understand and interact with their physical environment in a more engaging way. Some of the knowledge students gain include Newton’s Laws, chemical elements, the universe, and geologic concepts.